By descent in the Honywood family until at least 1880, when exhibited at the Royal Academy on loan from Sir Courtney Honywood, 7th Bt. ; Recorded as sold in Graves and Cronin in 1899; Recorded as ‘untraced’ in David Mannings’ Reynolds catalogue in 2010; French Private Collection until 2012. Royal Academy 1784, no. 138, as ‘Portrait of a Gentleman’ Royal Academy 1880, no.39. 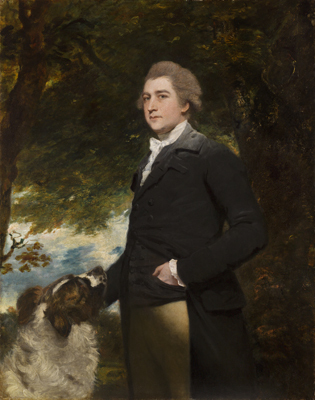 Joshua Reynolds’s career was not only celebrated in his day, but left a lasting influence on British art. He was the first President of the Royal Academy, and in his ‘Discourses’ set a pattern for portraiture that was faithfully followed for over a hundred years. As with all great figures who dominate that which succeeds them, it is hard now to comprehend just how revolutionary Reynolds’ art was. His work, however, should not be compared to Lawrence and Gainsborough, or Watts and Sargent, but to his predecessors; Lely, Kneller, Jervas, and even Hogarth. Portraiture in the seventeenth and early eighteenth centuries was too often stuck in a post-Van Dyck-ian rut. Its purpose was depiction, and its practitioners confined by technical inhibition. It was, to Reynolds, a blank canvas, and on it he painted in the ‘Grand Manner’ of Italian old masters. Henceforth, sitters were no longer bound by the rigid structures and decorum of ‘Society’ – which in portraiture translates into repetition – for Reynolds’ technical mastery allowed him to place subjects in whatever pose, setting, or characterisation he desired. The result was the complete reinvention of British portraiture. This important and newly discovered portrait shows Sir John Honywood, and is one of Reynolds’s finest late works. Painted in 1784, it was commissioned as a pendant with Reynolds’s portrait of Frances, Lady Honywood and her daughter [Bristol Art Gallery]. Reynolds’s sitter books record sittings on February 25th, March 8th, 18th, 23rd and 30th. The price was to be 100 guineas, although according to Reynolds’s ledger of 1787 the picture remained unpaid for, along with the portrait of Lady Honywood at 150 guineas. Both pictures were exhibited at the Royal Academy in 1784, where a contemporary watercolour shows them hanging either side of a giant triptych by Benjamin West. (Interestingly, no works by Gainsborough are shown in this hang, for this was the year he withdrew his pictures in protest at the way they had been displayed.) When at the RA, the picture was described briefly by the Morning Herald; ‘The colouring of this picture is firm and even’. Fortunately, the ‘firm’ colouring can still be seen today, for unlike many works by Reynolds, the present portrait is in exceptional condition, and has no sign of the fugitive pigments that so often make Reynolds’s sitters appear faded and ghost-like. Here, the rich colours of the foliage, the delicate dark pigments in the jacket and shadows, and the vibrant painterly drawing of the dog have all survived in a remarkable state of preservation. Sir John Honywood, was the head of an important Kent family, and lived at Malling Abbey, near Maidstone. After succeeding to the Baronetcy in 1781, he continued the family tradition of sitting in Parliament for various seats in the county, and was first elected to the House of Commons on the family interest at Steyning in 1784, the same year he sat for this portrait. He was again returned for Steyning in 1788, but in 1790 switched to stand as MP for Canterbury, which he held until 1802, save for a short period in early 1797. Honywood’s political career was not, however, a great success, and he was repeatedly disappointed in his demands on William Pitt the Younger for office, applying for posts such as Receiver General for Kent, and a Lord of the Admiralty. When applying for the former post, he asked Pitt whether his son might be appointed to the post, for life, even though he was not yet five years old. Pitt was ‘surprised’ at the request. Honywood also served as a Captain in the Kent yeomanry, and in the Kent riflemen. When he died in 1806, his widow was obliged to seek relief from the Prince of Wales, saying that her husband had left he estates so encumbered debts that she was threatened with prison, and was at the mercy of her ‘unprincipled’ son. The family finances cannot have been too straitened, however, as the present portrait remained in the family until at least 1880, when it was again exhibited at the Royal Academy, on loan from Sir Courtenay Honywood, the 7th Baronet. However, it is not known if Reynolds was ever certainly paid for the picture.